A FOCUS on improving his approach to training has Essendon's Shaun Edwards set for a more productive second season at the club. Edwards arrived at the Bombers during the 2013 trade period after two seasons with Greater Western Sydney. Despite producing some impressive patches of form for the Essendon VFL team, he didn't register a senior game. However, the club has noticed a change in the 21-year-old's application during the first two months of this pre-season, in what Bombers high performance football manager Neil Craig described as "chalk and cheese" in comparison to last year. "The thing I've really liked about Shaun this pre-season is, I think there's starting to be a change in mentality," Craig told AFL.com.au. "I think he's starting to develop an elite mindset about what's required to be able to perform at this level, and sometimes it takes different individuals different amounts of time to be able to get that picture in their head. "At the moment, with the way he's applying himself, he's actually giving himself every opportunity to be selected." Edwards, a tall and exciting flanker with good foot skills, played 10 games for the Giants in their debut season of 2012, but managed just two matches in 2013 before being traded to the Bombers. He arrived at the club with fellow Giant Kurt Aylett in exchange for the Bombers' pick 48, and Aylett played two games in 2014 before being delisted and re-selected as a rookie by the Bombers. Craig said the club had worked closely with Edwards to fast-track his progress. "The development coaches and line coaches – in particular the development department – have spent a lot of time with Shaun in developing his mental talent and mental skills. That's the main area that he needs to work on," he said. The way the younger players returned from their off-season break set the tone for a strong block in the pre-season according to Craig. "To come back in the shape they did sets a really good standard for the rest of the new players coming in and sends a really good message to the senior group," he said. Jackson Merrett and Elliott Kavanagh are entering their fourth AFL seasons and have been seen as strong performers in pre-season, with Craig indicating Kavanagh had responded well after exploring a trade at the end of last season which didn't eventuate. "In the case of Elliott, he's now actually increased his workload which is a great credit to him and he's starting to become in charge of his own performance," Craig said. "That's the way it should be." 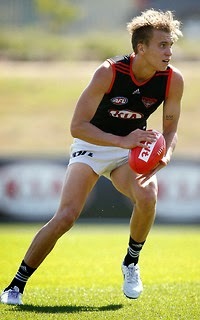 Kavanagh finished second in the final time trial before the club's Christmas break, with Essendon players set to resume training on Monday, January 5.